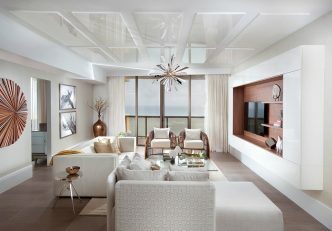 In most of our residential design projects, we take care of every piece of the project from start to finish. Creating beautiful home designs is without a doubt our specialty, but project management also plays an important role in the design process. 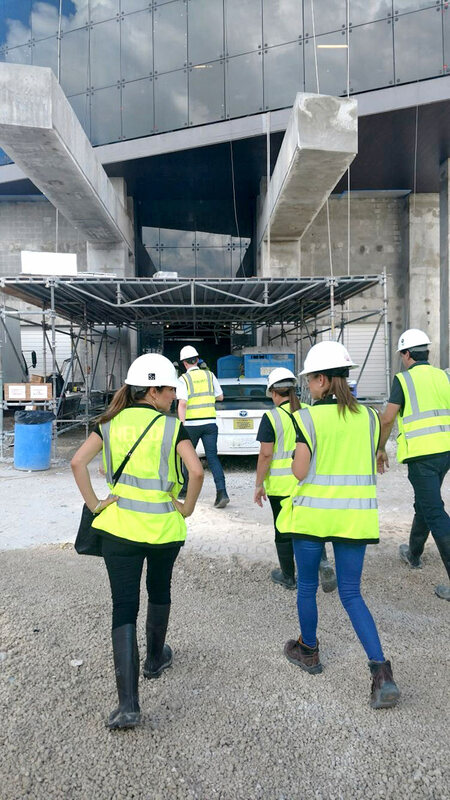 It’s an added value to our clients that our Miami interior design firm isn’t just a team of talented, professional designers, but also experienced project managers. This allows us to guide our clients through the process and ensure it runs smoothly—making a big change as painless as possible. 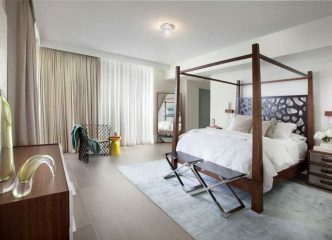 For interior designers, working in apartment or condo buildings, rather than single-family homes, is even more challenging. It requires that our team understands—and follows—each and every building’s guidelines. While the rules can vary, our team knows the basic questions that need to be asked at the beginning of each design project. If you’re looking to do some remodeling or redecorating in your luxury condo building, stick around as Kishia, our interior design project manager, shares practical project management tips you need to follow when designing in an apartment building. The first step in interior design project management, before we even make a single design plan is to learn the building’s guidelines. 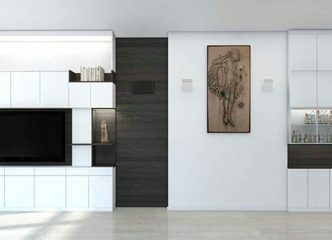 Requirements and specifications that are applicable to interior designers are contained in these regulations. You should take care to understand the restrictions and conditions on vendors, furniture deliveries, and our design team. One important guideline to know before beginning work is what types of insurance are required to work in, or even enter, the building. If these are not clear from the guidelines, you should always ask. That’s our next tip! Plan an initial visit to get to know the building – For our Luxe Waterfront Condo project in the Muse Residences building, we did it together with our clients. Step right up and introduce yourself to your building contact. Get their phone number and email so you can always reach them when you need to ask for information. But don’t stop there, get to know everyone—front desk, receiving, valet, management office, etc. You never know when you’ll need to ask for help! A box of chocolates, donuts, or any special treat goes a long way. Also, knowing their working hours is essential. We always create a contact list with basic info (like phone numbers and emails) and make it accessible for the whole team. As soon as possible, especially if your building is under construction, take a trip to see the existing conditions of both the building and unit. 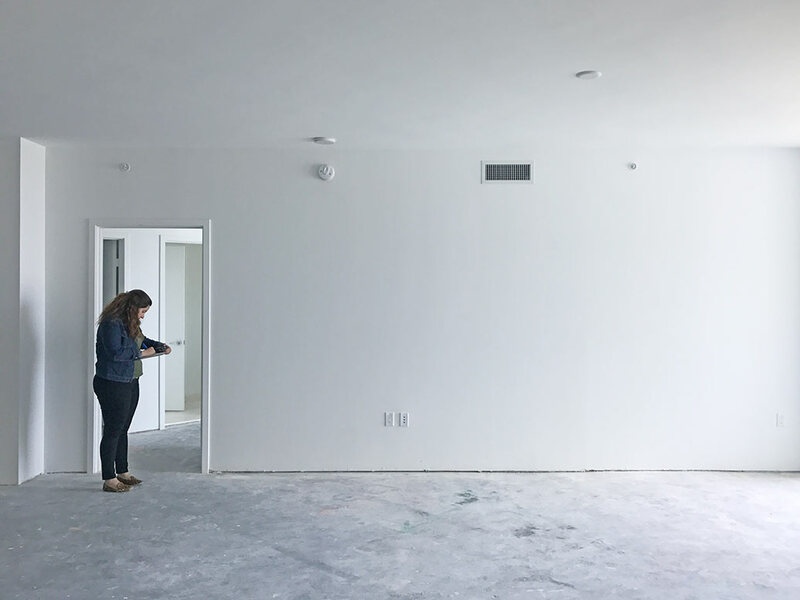 Our interior design project manager, Kishia, suggests that you tour the building first to identify parking facilities, delivery and resident entrances, trash dumpsters, and additional access areas. These not-so-glamorous spaces are key during the design and construction phase. 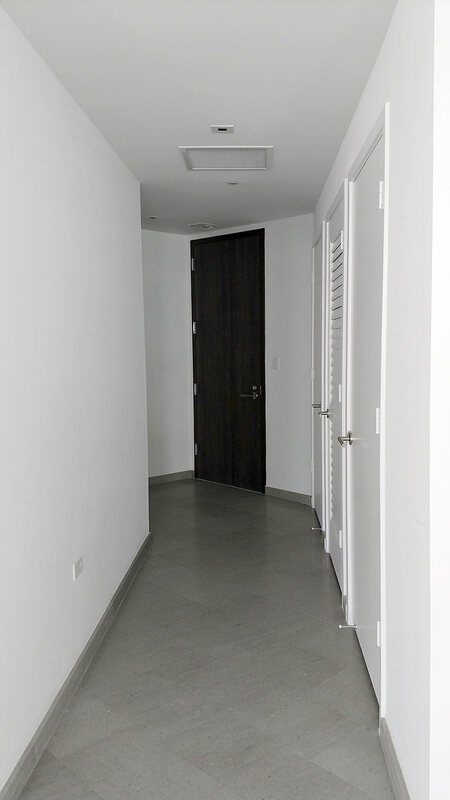 More project management tips: don’t forget to measure the elevator and the hallways leading to the unit. And something that people might forget, but shouldn’t, is to know the weight restriction and capacity limits of the elevators! 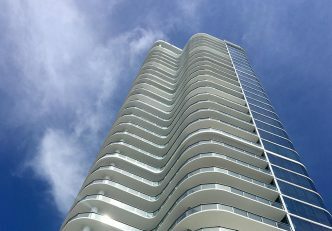 For our Waterfront Penthouse project in Fort Lauderdale, the elevator couldn’t hold the weight of a custom table we designed. But don’t worry, we made it work! We delivered the table into the unit through the balcony! Read the story here. 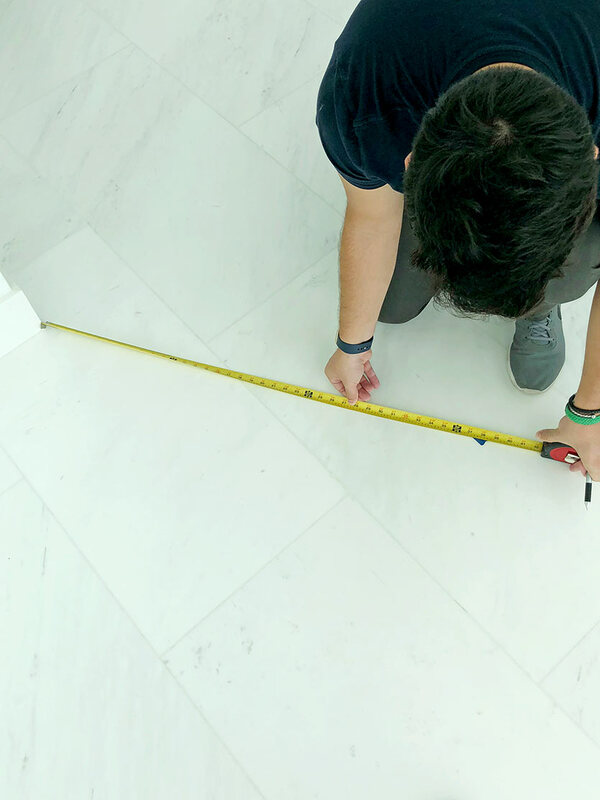 Once in the apartment, measure and inspect every item and room. Measure rooms to determine the proper furniture size and scan the bathrooms and kitchen to see if hardware (towel bar, hooks, toilet paper holder) is included. It sounds silly but some buildings don’t include it! Remember to triple check those corners and hallways, they can limit a long sofa or art piece from getting through. This is key: Stop by the unit at night to clearly see where you’ll need more light. 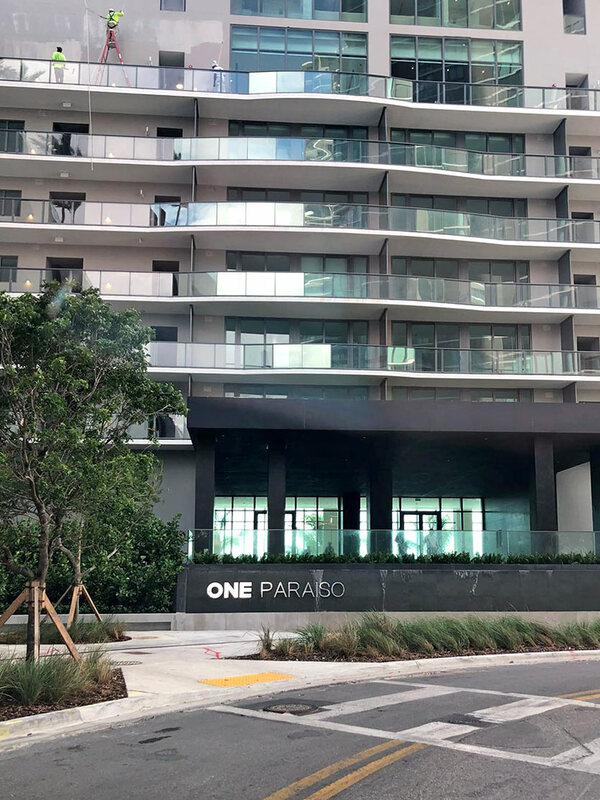 Visiting the One Paraiso building as we are working on our Nature-Inspired Condo design. 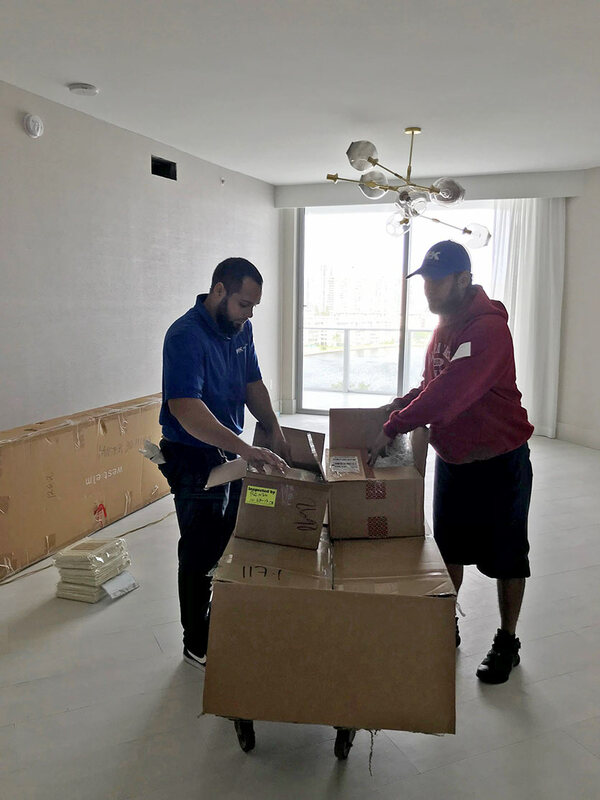 Furniture delivery days should be scheduled in advance with the building so that you’ll have an accessible elevator and someone is there to receive the deliveries and open the unit. Elevators have peak usage hours, so plan around these if possible when scheduling a delivery. Whether you’re a homeowner or design professional, be sure to meet your building management and delivery crew before a big delivery. Troubleshoot anything they might need, as they’re likely to be more accommodating than the inpatient delivery guy. Make sure all vendors and delivery companies you’re working with have the proper insurance. 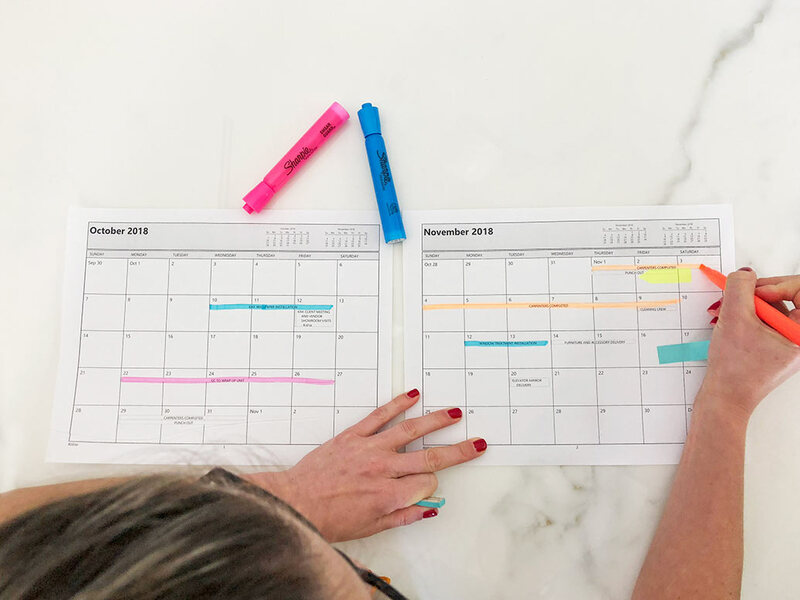 It’s important to understand their working hours and their best days for delivery so you can coordinate with your schedule and the building’s schedule. As interior design project managers, we take care of the day-to-day for our clients to ensure the design and installation process is smooth so that our clients can relax in their dream homes from the moment we hand over the keys! We hope you find these project management tips useful! 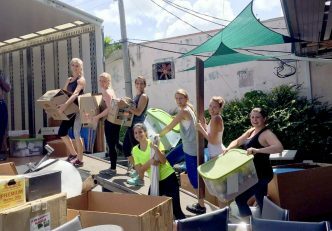 If you are planning to move soon to your condo unit, check out these moving tips by Kishia.